I have been a crafty lady lately and today I am sharing an adorable, easy craft with you. All you need is a little felt (and I mean a LITTLE, scraps is fine! ), fabric scissors, and hot glue. Thank you to Emily for posting this tutorial! Cute!! I'm impressed. Looks so perfect. This is adorable! I am going to have to grab a piece of felt at school and try it myself. Yep this is adorable!! I LOVE bows...actually its a little obsession ha! Enter to win $150 worth of jewelry from JewelMint! Very cute. This would look sweet on a little girls' headband! Thank you for posting this!! 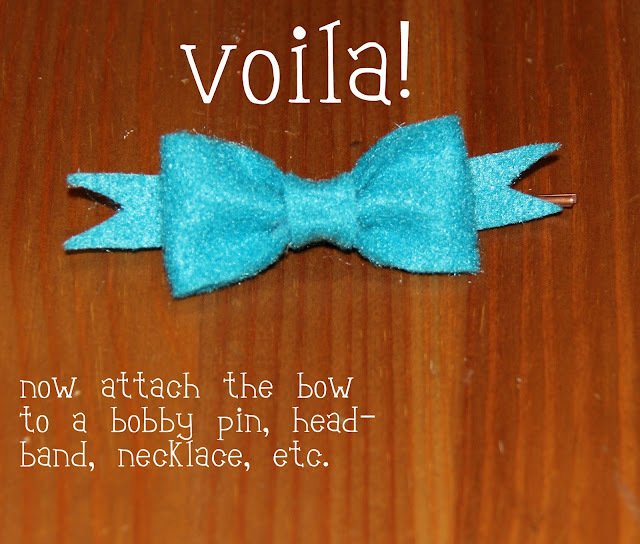 I've always wanted to know how to make a bow! how cute! the most perfect little bow. I can't wait to do this! Beautiful as always! gahh so cute! ok im gonna make a goal when we're settled in our new place - i'm going to go buy fabric and a glue gun and TRY to do a craft..... LOL we will see how it goes! Love this...and you! You are so gorgeous girl! :) So crafty too! This is super cute! I think I'll make one for Morgan. I am a new follower, thanks to D on Girls Love Fried Pickles....but this is even something I could do. And btw Ernie is awesome. I am a kitty and a doggie Momma. Peace out and keep putting stuff I can do on here.LOL craft challenged.